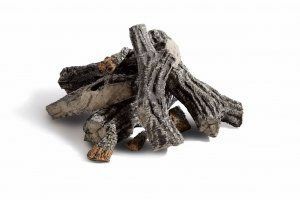 Ideal for fire pits and fire rings larger than 24"
If you love the look of a log fire, but don't appreciate the bother of splitting wood and cleaning up the ashes, try this gas log set by Hearth Products Controls in your outdoor fire pit. Each set comes with six logs made of gel-cast ceramic fiber construction and that have a realistic gray and black design that makes your fire pit look like you gathered wood specifically for your outdoor centerpiece (which you kind of did). The set contains six hyper-realistic logs that vary from 15" to 19" in length. This large set is suitable for fire pits and rings that are larger than 24" in diameter, so get the perfect fit for your fire pit that you've been looking for. How do I position these Hearth Products Control 6 piece Woodland ceramic fiber logs for the best look and flame? Per the manufacturer, the placement of these logs is completely at your discretion. With vented outdoor logs, there will not be typical concerns (sooting, etc.) that are a factor with indoor logs. As a general rule of thumb, placing gas logs directly over burner ports will cause flame impingement and poor flame appearance. I placed four around the unit and two on top.